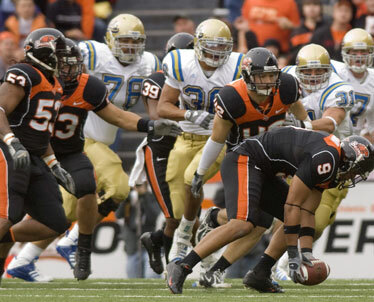 Kahuku graduate Al Afalava recovered a fumble for Oregon State during yesterday's game against UCLA. CORVALLIS, Ore. » Ben Olson threw for 220 yards, Brandon Breazell had two touchdown receptions and UCLA scored four fourth-quarter touchdowns to beat Oregon State 40-14 last night. Oregon State returner Gerard Lawson fumbled three consecutive kickoff returns in the fourth quarter, losing two to set up Bruins touchdowns. The Bruins (4-1, 3-0) got 80 yards rushing, 49 yards receiving and two TDs from Kahlil Bell. Olson, who was playing for the first time since suffering a concussion against Utah, was 14-for-25. UCLA has beaten the Beavers five straight times. Leading 14-12, the Beavers (2-3, 0-2) fell apart in the fourth quarter. Lawson was called for a personal foul for hitting Terrence Austin out of bounds on a punt return. Olson then hit Breazell for a 69-yard score with 9:12 in the game to give the Bruins their first lead. Then Lawson muffed a kickoff return. Then another. Then another. The first one led to Bell's second touchdown. Breazell caught a 30-yard TD after the next fumble. The Beavers recovered the third, but a punt was blocked. Chris Markey ran in for a touchdown and it was 40-14 Bruins about 7 minutes after the Beavers had the lead. TUCSON, Ariz. » Willie Tuitama threw for five touchdowns and freshman Nicolas Grigsby rushed for 186 yards in his second Arizona start, leading the Wildcats (2-3, 1-1) to a victory over the Cougars (2-3, 0-2). Grigsby carried 30 times and caught nine passes for 76 yards, including a 22-yarder for a touchdown. Tuitama, increasingly comfortable in first-year coordinator Sonny Dykes' spread offense, completed 22 of 31 for 346 yards with no interceptions.